Nine games in and our losses column still reads zero, writes Rocks supporters' club chairman Ian Guppy. It’s a stat many fans would have seen as pie in the sky at the start of the season, but that winning feeling is something that’s great to experience, and I’m certain the players are feeling the same. Some have said the Velocity Trophy is a cup we shouldn’t have entered but I believe we had to, and the attitude and endeavour shown on Tuesday night in beating Whitehawk 8-0 shows that entering is worth it... as a winning side is a confident side. I went into the game with apprehension and worried that our young side could be in for quite a beating against a physical Whitehawk side with a good few first-teamers. But the Rocks, including more new young faces, proved many wrong and deservedly won a superb game under the lights at the Nye Camp. Being 1-0 up at half time, I don’t think anybody would have expected the second-half goal-feast but it was totally deserved – we were ruthless, we were relentless and this has been coming for a number of months with the way we play. It was a joy to watch. It was great to see Jordan Matthews make his debut in goal and get that clean sheet too. It shows that there are those gems in County League who can step up and although he had few saves to make, he looked calm, confident and assured in all of the decisions he made and that is a positive for the club. Josh McCormick made his full debut too after being on the bench for the 1-1 draw at Carshalton at the weekend and he stepped up with confidence. Josh is a lad I refereed a few weeks ago for Portsmouth Colleges as they played the Chi College side at Nyewood Lane and he stood out as one to watch, alongside Liam Brady and Jamie Carroll, who both featured for us in pre-season. The quality of play in that game shows that there is a lot of talent locally and that must mean a bright future for the game. It has been mentioned that local talent isn’t being given an opportunity but I guess this needs to be looked at with a sense of realism – we are playing at a very high standard in the Bostik premier. If players are playing for us who are from the Brighton or Portsmouth area, in my opinion that is local talent and to expect a side made up of Bognorians isn’t feasible. 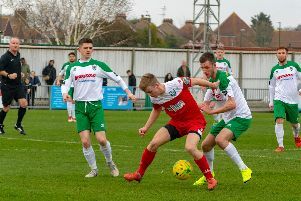 Our neighbours Worthing have been praised on social media for having the right policy for recruitment but in their game versus Margate recently only one of their starting XI had come through their youth team. Many of their team were Brighton and Portsmouth graduates who haven’t quite made the full step up to professional football, or those starting their careers and playing vital men’s football while on loan. This is exactly our model and because of our geographical location, it is the ONLY way we can survive as expecting a side consisting only of Bognor-based players is very unrealistic. Having a squad consisting of players who train together and have grown up together is a huge positive. McCormick and Brad Lethbridge have come through the system together and that link could be seen on Tuesday night – and can only bode well for the Rocks in coming weeks.